BANGI, 20 Nov 2013 – Malaysia should step up the use of wastes derived from the forestry, agriculture and plantation sectors for the production of alternative sources of energy and food. A researcher of The National University of Malaysia (UKM), Prof Dr Sarani Zakaria said biomass known as Lignocellulose can be used to produce fuel that is free of petroleum, especially important now as the price of fossil fuel is rising or becoming unstable. Delivering her inaugural lecture here earlier this month, Prof Sarani said other than fuel for machinery, lignocellulose can meet the demands of the food, health, textiles and other industries. In the lecture titled Lignocellulose: Renewable Resources for Eco-Friendly Biopolymer Products, she said we have to use wood and plant resources which otherwise would become waste material because the processing can be done by industries at reasonable cost. Prof. Sarani believes that lignocellulosic biomass is the raw material that is the crux of discussion and research in the 21st century, as it is easily available, cheap, plentiful and a sustainable resource. She said Malaysia produces over 100 million tons of lignocellulose a year in which 94% is from of the oil palm sector, 4% from the timber industry and 1% from rice straw. This is an invaluable source of biomass for the economy. This means that the spin-off products can yield worthwhile returns. An example is the fermentation of lignocellulosic biomass to ethanol, a fuel that is an alternative to fossil fuels such as gasoline and diesel. This biomass is a carbon-neutral source of energy and because it comes from plants, combustion of lignocellulosic ethanol does not emit carbon dioxide into the air. One of the obstacles to the production of ethanol from biomass is that the sugars needed for fermentation of lignocellulose are trapped inside. Lignocellulose can be obtained mainly from biomass derived from wood and plants, such as fruit fibre, fruit bunches, rice straw, bagasse, stems and leaves. It is known as lignocellulose because its main chemical component is cellulose and lignin in addition to some other chemical components such as hemicellulose. Wood waste from the construction industry, sawdust and wood residues from sawmills; garbage such as boxes, paper, newspapers, office stationery, magazines and old books are sources of lignocellulose that are very useful. Among the products successfully made by her and her research group from lignocellulose at the Faculty of Science and Technology were pulp, paper and paper magnets and polyurethane (a type of plastic). She said that the products of the pulping process, chemical modification and synthesis of new materials, can be the engine of growth for industries such as paper, textile, pharmaceuticals, polymers, automotive, plywood and others. She expressed confidence that the use of lignocellulosic biomass will reduce forest logging exploration and problems of waste disposal by municipal councils. 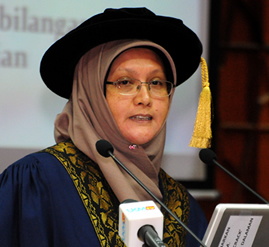 Prof Sarani was appointed lecturer at the materials science programme in UKM in 1995. She is an expert in the field of bioresources-based materials, especially from plant lignocellulosic material. She secured several research fellowships and is currently serving as the head of the Science and Applications cluster for Evaluation at UKM.